There is a big push now to build more affordable housing in better neighborhoods. This includes earmarking a percentage of apartments in more exclusive high-rises for low-income tenants. In some areas like New York, developers even get a tax abatement for providing low-income housing. 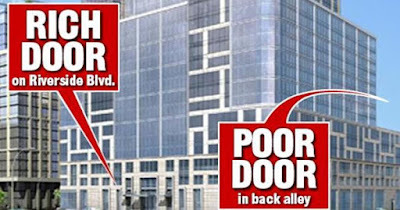 But creating separate entrances for the poor, known as "poor doors," was not part of the plan. The separate entrances idea was deemed to be another form of segregation by many. Even though the poor are still sharing the facilities with those who are wealthier, the idea of a separate entrance is viewed as just another form of discrimination. Jonetta Rose Barras from The Post referred to it as "a blast from an unpleasant past.” She continues, "Growing up I experienced separate water fountains, separate bathrooms and separate entrances to restaurants and hotels, among other things." 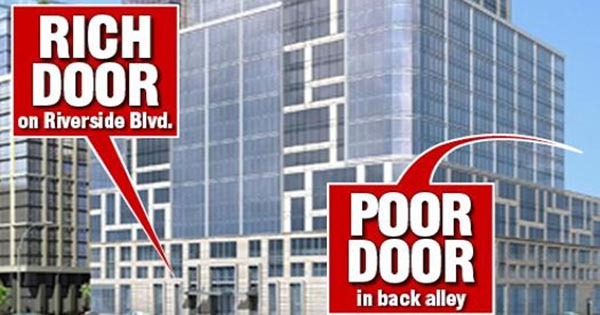 While the idea of offering low-income housing within better neighborhoods is very appealing to low-income families, the whole idea of having to use a separate entrance is both shocking and considered un-American.